Installing Office Connector - Event 1 Software, Inc. The major steps are outlined here with details listed in individual sections below. Review the minimum system requirements. Use Add/Remove Programs to install the program. In a nutshell, you’re going to need to satisfy the minimum requirements for Timberline Office, have the ODBC driver activated and have Microsoft Excel installed. The complete list of minimum requirements is listed on our website. Navigate to the Download page for Office Connector on our website. Complete the contact information on the web form and click Download. In the dialog that comes up, click Save and save SetupOfficeConnector.exe to your desktop or your "C:Temp" folder (you may delete this file later). Run the SetupOfficeConnector.exe program that you downloaded in the previous step. A message box will come up saying that the file is a self-extractor. Click OK. The WinZip Self-Extractor window comes up with the Unzip To Folder box initialized to "C:Event1". If you will be installing to more than one computer, then you should change the Unzip To Folder to a location on the network that the other machines will be able to access, ideally the same folder you specify for the Event 1 System Folder (see below). Click Unzip and the setup package will be extracted to the location you specified for the Unzip To Folder. Click OK on the confirmation message and a web page will be displayed with directions on how complete the install using the Add/Remove Programs control panel applet. You may delete the SetupOfficeConnector.exe file that you downloaded earlier, as it is no longer needed. You may, however, wish to retain a copy of it as a back up. Make sure that Excel is not running; if Excel is running during the install, then you will have to manually install the add-in at a later time. You do not need to install Office Connector on the Timberline server unless you are going to run Office Connector under Citrix, and the Timberline server is also the Citrix server. Office Connector is a workstation install and it is not designed to be shared over the network. You should install Office Connector on each workstation locally. You can rest assured that you are installing the program correctly if you accept the defaults during the setup process. It is possible to install Office Connector on a Terminal Services or Citrix server, however a careful review of the Considerations for Terminal Services and Citrix page is strongly recommended. 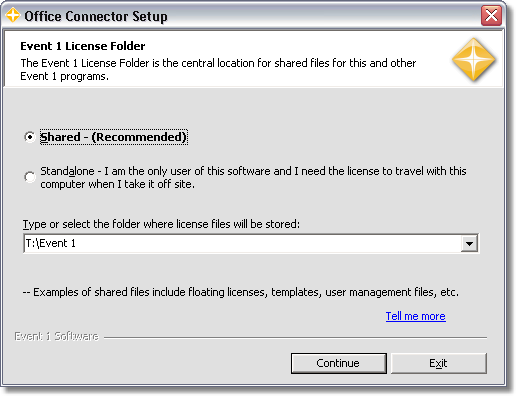 During the installation, you will need to specify the location for the Event 1 System Folder: Under normal circumstances, select the option to give this computer access to shared files in a network location and use the dropdown list to browse to a folder on your Timberline server. Should you decide to designate the Event 1 System folder in a shared location other than your Timberline server, keep in mind that, whatever the drive letter, the folder must be at the root of the network share and not a subfolder of it. Additionally, You can type in :Event1 following the drive letter and the installer will offer to create the folder for you if it doesn't already exist. All of the Office Connector workstations on your network must reference the same folder. We recommend making it something easy to enter, such as T:Event1. You may need to restart your computer after setup has completed. Since there is no way for our setup program to tell if the Microsoft package requires a restart, our setup program always displays a message saying that we recommend a reboot. Normally a reboot is not required, and it is safe to try the program without restarting. If you experience unexpected behavior or any of the visual elements look funny, you should try rebooting before contacting support. On some older systems, the installer will notify you that your system files are out-of-date. If this happens, allow Setup to update your system files, reboot and run setup again. The installation instructions are contained in a file called InstallSteps.htm, which is located in a subdirectory under the folder you specified in step 3 of "Extract the Setup Package".